The life of a monastery revolves around following the instructions of the Buddha: practicing generosity, practicing virtue, and developing the mind. Every morning, Winnipeggers come to the monastery and offer food to the monks. While they are here they have the opportunity to learn how to practice the Buddha’s teaching in their daily lives. If they have questions or need advice, the monks are available to talk with them. The monks encourage them to follow the five training precepts the Buddha gave to lay people. 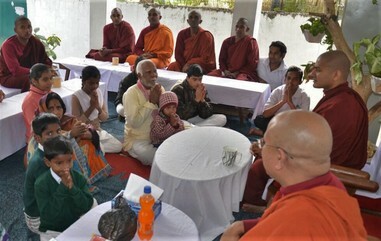 Using the material support offered by the lay people, the monks can then spend their time devoted to meditation, study, and Dhamma discussions. In the evenings and on the weekends there are activities organized for the public to come and practice the Buddha’s teachings. Some of these focus on meditation, some focus on learning, and some focus on practices like chanting. There are some activities especially for young adults and children. From time to time lay people will gather at the monastery to organize social service activities such as blood drives and collections for local food banks.